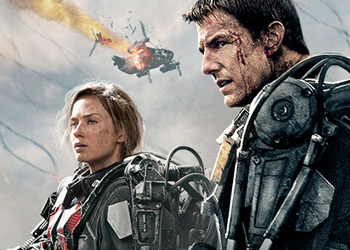 Warner Bros. Pictures and Village Roadshow have released the final trailer for director Doug Liman's Edge of Tomorrow. Check it out in the player below! Opening in 3D, 2D and IMAX 3D theaters on June 5, the sci-fi thriller stars Tom Cruise, Emily Blunt, Bill Paxton, Jeremy Piven, Ciaran Hinds, Noah Taylor, Kick Gurry, Dragomir Mrsic, Charlotte Riley, Jonas Armstrong, Franz Drameh, Masayoshi Haneda and Tony Way. The movie is based on the acclaimed novel "All You Need is Kill" by Hiroshi Sakurazaka.